This web site is owned and operated by Palomar Health, a public health district in California. By using this site, you agree that Palomar Health may monitor your use of this web site and may use the results of such monitoring without limitation. During your visit to our web site, we may request and collect personal information from you, such as your name, email address, physical address, telephone number and any other personal information you share with us. The information you will be asked to provide to us is voluntary only; you will always have the option of not providing the information if you so choose. 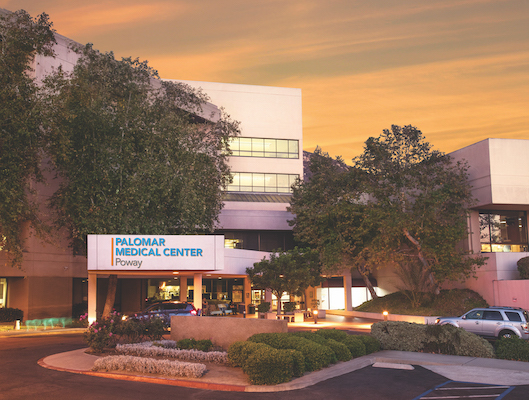 The information we gather from you is used either in connection with your interest in employment opportunities with Palomar Health, or if you have questions or concerns you would like to share with Palomar Health. Some non-identifiable information is gathered from you for a marketing survey our Human Resources Department uses to determine where you learned about our web site. Palomar Health does not disclose, give, sell, or transfer any personal information to third parties for non-Palomar Health use. Personally identifiable information may be collected from visitors to our site and provided in an aggregate form to other parties within the Palomar Health family for marketing, advertising or other similar uses. We provide several ways to e-mail us with questions you may have as you navigate through our site. Please note that any information sent through an e-mail message is unsecured and can be seen on computers which transfer data from your computer to Palomar Health. We recommend that you do not email sensitive personal health information, or any other confidential information, to Palomar Health or anyone else. Should you choose to provide information in this manner, you do so at your own risk. You may not copy, reproduce, republish, post, retransmit, or distribute in any way any of the information or materials in this web site without the prior written consent of Palomar Health. To request such permission, send an email message to tlc@palomarhealth.org including your name, address, the information you are requesting to distribute, and the purpose for that distribution. You may download a copy of the materials on this web site on a single computer for personal, noncommercial home use, but only if you do not remove any copyright, trademark, or other proprietary notices from the materials you download. You agree to indemnify Palomar Health if you infringe on any of Palomar Health's copyrights or trademarks. You may not restrict or inhibit any other user from using this web site. PALOMAR HEALTH DOES NOT GUARANTEE THE ACCURACY, TIMELINESS OR COMPLETENESS OF SUCH INFORMATION AND CONTENT AND MAKES NO WARRANTY, EXPRESS OR IMPLIED, REGARDING THE USE OF SUCH INFORMATION AND CONTENT. PALOMAR HEALTH ASSUMES NO LIABILITY OR RESPONSIBILITY WHATSOEVER OF ANY KIND FOR THE INFORMATION OR CONTENT CONTAINED IN THE WEB SITE, OR FOR ANY DIAGNOSIS OR TREATMENT MADE IN RELIANCE THEREON. THERE ARE LINKS FROM THIS WEB SITES TO WEB SITES OPERATED BY THIRD PARTIES ("LINKED SITES"). 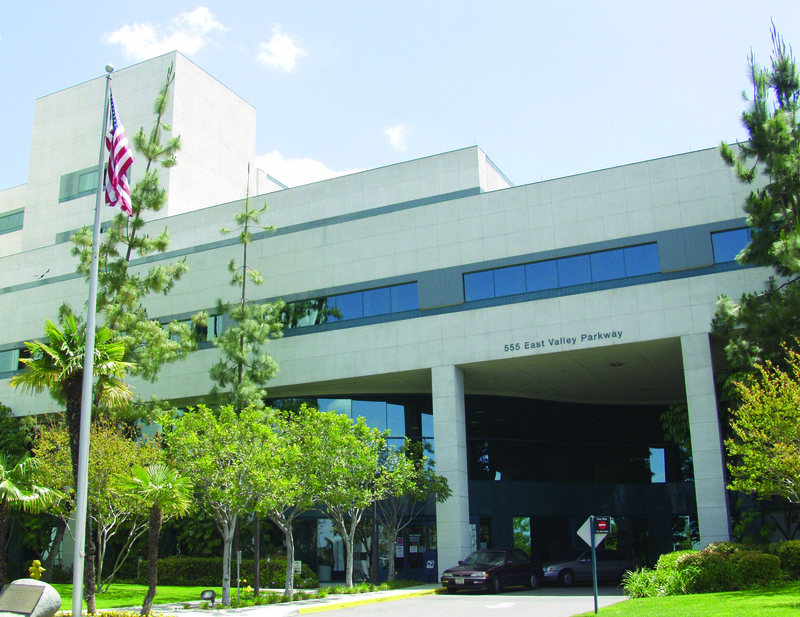 PALOMAR HEALTH MAKES NO REPRESENTATIONS OR WARRANTIES REGARDING THE ACCURACY, INTEGRITY OR QUALITY OF THE LINKED SITES. CONSEQUENTLY, PALOMAR HEALTH WILL NOT BE LIABLE IN ANY WAY FOR THE LINKED SITES, INCLUDING, WITHOUT LIMITATION, FOR ANY LOSS OR DAMAGE OF ANY KIND INCURRED AS A RESULT OF YOUR USE OF THE LINKED SITES. YOU HEREBY IRREVOCABLY WAIVE ANY CLAIM AGAINST PALOMAR HEALTH WITH RESPECT TO THE LINKED SITES. YOU AGREE THAT YOU MUST EVALUATE, AND BEAR ALL RISKS ASSOCIATED WITH THE USE OF THE LINKED SITES, INCLUDING, WITHOUT LIMITATION, ANY RELIANCE ON THE ACCURACY, COMPLETENESS OR USEFULNESS OF THE MATERIAL CONTAINED ON THE LINKED SITES. THIRD PARTIES MAY OFFER GOODS AND SERVICES TO YOU THROUGH MARKETING THAT IS MADE AVAILABLE AT OR THROUGH THIS WEB SITE. UNLESS OTHERWISE EXPRESSLY STATED, PALOMAR HEALTH MAKES NO ENDORSEMENT REGARDING SUCH PARTIES, NOR DOES PALOMAR HEALTH MAKE ANY REPRESENTATION, RECOMMENDATION OR WARRANTY WITH RESPECT TO THESE THIRD PARTIES' GOODS, SERVICES OR ADVERTISING. 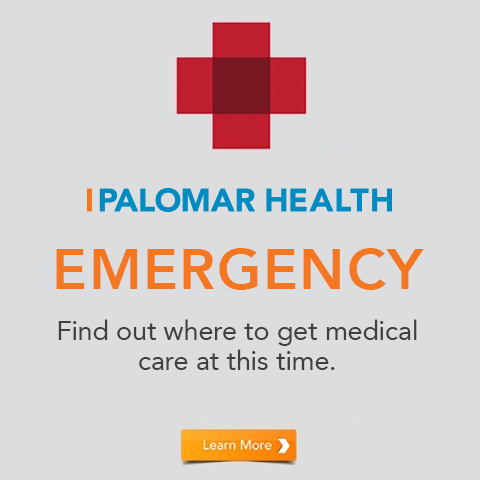 YOU AGREE TO HOLD PALOMAR HEALTH HARMLESS IN CONNECTION WITH THE SELECTION OF THIRD PARTY ADVERTISERS, AS WELL AS THEIR ACTS AND OMISSIONS. ALL MATERIALS ON THIS WEBSITE ARE PROVIDED "AS IS" AND PALOMAR HEALTH EXPRESSLY DISCLAIMS ANY AND ALL WARRANTIES OF THE MATERIAL PROVIDED HEREIN, EXPRESS OR IMPLIED, INCLUDING ANY: (I) IMPLIED WARRANTIES OF DESIGN, MERCHANTABILITY, OR FITNESS FOR A PARTICULAR PURPOSE OR TITLE, (II) WARRANTIES ARISING FROM A COURSE OF DEALING, USAGE OR TRADE PRACTICE, AND (III) WARRANTIES OF NON-INFRINGEMENT. NO ORAL OR WRITTEN INFORMATION OR ADVICE GIVEN BY PALOMAR HEALTH IN CONNECTION WITH THIS WEB SITE WILL CREATE ANY WARRANTY. PALOMAR HEALTH DOES NOT WARRANT THAT THE FUNCTIONS CONTAINED IN ANY OF THE SERVICES OR PRODUCTS PROVIDED ON THIS WEBSITE WILL MEET YOUR REQUIREMENTS, THAT THE OPERATION OF ANY SUCH SERVICES OR PRODUCTS WILL BE UNINTERRUPTED OR ERROR-FREE, THAT DEFECTS IN ANY SUCH SERVICES OR PRODUCTS WILL BE CORRECTED, OR THAT THIS SITE OR THE SERVER THAT MAKES IT AVAILABLE ARE FREE OF VIRUSES OR OTHER HARMFUL COMPONENTS. FURTHERMORE, PALOMAR HEALTH DOES NOT WARRANT OR MAKE ANY REPRESENTATIONS REGARDING THE USE OR THE RESULTS OF THE USE OF ANY SUCH SERVICES OR PRODUCTS IN TERMS OF ITS CORRECTNESS, ACCURACY, TIMELINESS, RELIABILITY OR OTHERWISE. 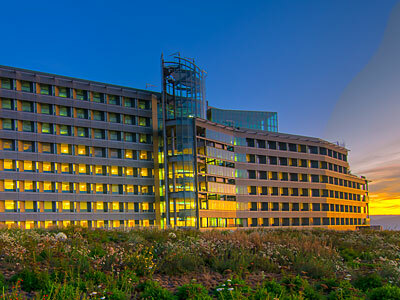 PALOMAR HEALTH SHALL NOT BE LIABLE FOR ANY DIRECT, INDIRECT, INCIDENTAL, SPECIAL, CONSEQUENTIAL OR PUNITIVE DAMAGES THAT RESULT FROM THE USE OF, OR THE INABILITY TO USE THE MATERIAL IN THIS WEB SITE. (User Information, Data, and Content) PALOMAR HEALTH ASSUMES NO LIABILITY OR RESPONSIBILITY FOR THE INFORMATION, DATA OR CONTENTS GENERATED BY YOU IN CONNECTION WITH THIS WEB SITE OR SERVICES. PALOMAR HEALTH EXERCISES NO AUTHORITY OVER SUCH INFORMATION, DATA AND CONTENTS, DOES NOT REVIEW OR MONITOR SUCH INFORMATION, DATA AND CONTENTS, AND WILL NOT BE LIABLE OR RESPONSIBLE FOR DETERMINING THE ACCURACY, TIMELINESS, COMPLETENESS, APPLICATION OR CORRECT USE THEREOF.